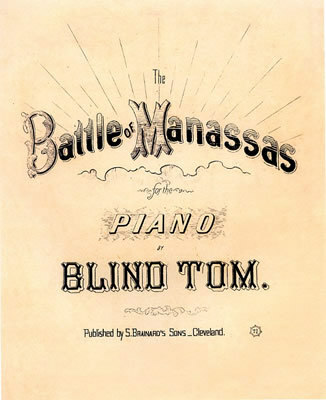 Battle of Manassas was written by Thomas Wiggins (aka "Blind Tom") at the age of 12. "Tom will now play for you his Battle of Manassas. This is a piece of his own conception of a battle. "The circumstances under which he produced it were these: soon after the battle occurred, I happened to a very serious accident which kept me in Nashville [Tennessee] for several months. Tom was often in my room. Every little paragraph about the battle was discussed in various forms for a week or more. He heard this thing read of and talked of, and after hearing it for ten days he took his seat at the piano and produced what he will now play for you; and when asked what that was he was playing, his reply was, that it was his Battle of Manassas. "In the first place he will represent the Southern Army leaving home to their favorite tune of 'The Girl I Left Behind Me,' which you will hear in the distance, growing louder and louder as they approach Manassas (the imitation of the drum and fife). He will represent the Grand Union Army leaving Washington [DC] to the tune of 'Dixie.' You will all recollect that their papers, and our papers, and their prisoners, spoke of the fact that when the Grand Union Army left Washington, not only their bands were playing 'Dixie,' but their men were also singing it. "He will represent the eve of battle by a very soft sweet melody, then the clatter of arms and accoutrements, the war trumpet of [General P. G. T.] Beauregard, which you will hear distinctly; and then [General Irvin] McDowell's in the distance, like an echo of the first. He will represent the firing of the cannon to 'Yankee Doodle,' Marseillaise Hymn, Star-Spangled Banner, 'Dixie,' and the arrival of the train of cars containing General Kirby Smith's reinforcements; which you will all recollect was very valuable to General Beauregard upon that occasion, after the arrival of which the fighting will grow more severe, and then the retreat." After the Battle of Manassas, Tom and his manager were confined in Nashville for several months and every newspaper account of the battle was discussed in detail for days on end. After hearing the battle discussed for several weeks, Tom sat down at the piano and produced a composition incorporating melodies representing the Union Army, the Confederate Army, and Confederate and Union leaders Beauregard and McDowell. The composition became a popular signature piece and a favorite with concert audiences in the South.